Hair accessories and wedding jewellery by Hermione Harbutt. Hermione Harbutt provides award winning couture bridal accessories. Each piece is individually handmade from the finest gemstones, Swarovski crystals, and freshwater pearls. 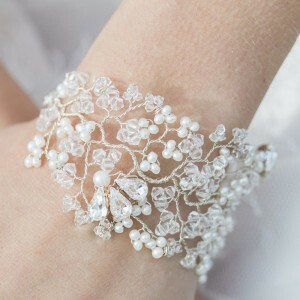 Hermione Harbutt wedding accessories range consists of wedding earrings, wedding bracelets, wedding necklaces, wedding tiaras, wedding hair accessories and other delights such as broaches and rings. Hermione provides exemplary service and high quality accessories. In order to achieve absolute perfection and a totally unique set of ladies accessories, you are welcome to attend the Hermione Harbutt studio by appointment. We offer a bespoke design service to have your accessories personally designed. International customers can also benefit from this high-class bespoke accessories design service via telephone and email consultation. Accessories can also be made with diamonds and precious gemstones. We also offer a service to wedding guests and family. We often help the mother of the bride and sometimes the mother of the groom accessorise their outfit and make a lasting impression.